Jacob van Hulsdonck was a Flemish painter who played a role in the early development of the genre of still lifes of fruit, banquets and flowers. 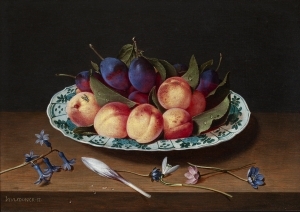 Van Hulsdonck was particularly skilled in rendering the softness and delicacy of the skins of the fruit. He was a master in bringing out the difference of texture and colouring of the various types of fruit and their foliage.